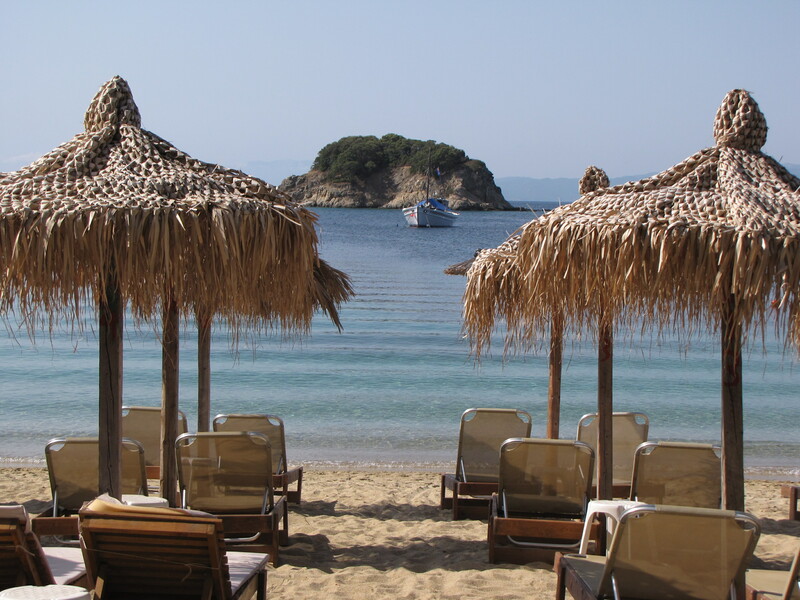 The spotless beaches of Skiathos Island and its bright blue seas make a luxury Greece holiday with Jasmine Villas an ideal choice. The property is set in a secluded spot on the edge of the Troulos Resort and majestically overlooking the sea, within easy reach of the beach, tavernas and shops. Each villa has its own garden and a pool with view to the sea, where you can enjoy swimming, private sun bathing, or simply admire glorious sunsets and the distant views of Skiathos Island. Jasmine Villas Property is family owned and run, a true home from home experience. Situated in the resort of Troulos, Jasmine Villas offer real holidays of distinction. The three luxury villas offer privacy and seclusion with all the comforts and necessities. They are tastefully decorated providing everything you could possibly need or want. The modern interior of the villas embody generosity and elegance down to the last detail. Outside there’s a courtyard-style terrace with private swimming pools, built-in barbecues, beautifully lanscaped gardens and roof terrace that features uninterrupted, panoramic views to the sea. All three deluxe private villas, sit on a remarkable site, located specifically to benefit from the spectacular view of the Sea. Nothing but the best inside and out, the property boasts one of the island’s most enchanting settings. Truly a present to your self. The newly built property of Jasmine Villas is located in the resort of Troulos, in Skiathos island – Greece, just 7 km away from the town of Skiathos and the airport, and 10 minutes walking from Troulos Bay and the organized beach of Troulos. The luxurious villas are located in a secluded spot, with magestic view to the sea. The three independent villas are surrounded by stonewalls to ensure discreet privacy. Jasmine Villas are ideal for those who seek the services of a world-class hotel, combined with the freedom of personal space. There are three private, independent villas available to its guests. Villa 1 & Villa 2: Each villa has two bedrooms with private bathrooms, spacious living room and a fully equipped kitchen. Villa 1 has a large terrace with a private pool. Villa 2, is on the second level offering magnificent view to the sea from the balcony. Both villas have garden, BBQ and their own private lot. Each villa sleeps 4 people. Villa 3: A three bedroom deluxe private villa, spacious living room where you can enjoy panoramic views to the sea and a fully equipped kitchen. Each bedroom has its own private bathroom. Additionally the villa has its own large terrace, a lush green garden and a private pool. All rooms are really spacious offering view to the sea. Villa 3 has BBQ and a private parking lot. It sleeps up to 5-6 people. Villa 1 and 2 have one bedroom with a double bed and space for one more single bed and 1 bedroom with 2 single beds.